This recipe takes the traditional Eggs Benedict and takes it to the next level with crispy pork belly and cheesy buttermilk biscuits. I’m not sure when I decided Eggs Benedict was one of my favorite breakfast dishes but every time I go out for brunch I always seem to order it. Even though I love regular eggs benedict, I just found out how you can kick it up a few notches! Instead of boring ol’ English muffins and Canadian bacon, let’s get real here…..cheesy buttermilk biscuits and crispy pork belly are the way to GO! 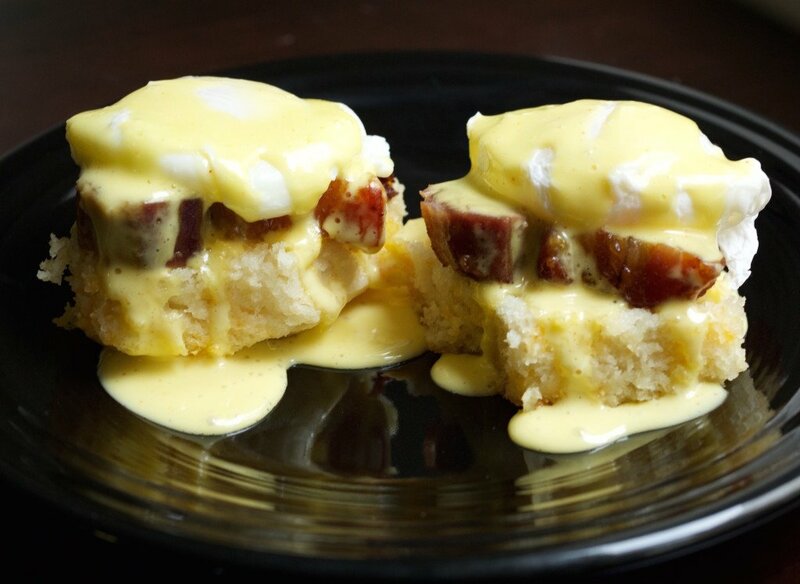 Follow this pork belly eggs benedict recipe and let your mouth start to water! In a small dish, mix together brown sugar, salt, and minced garlic to form a rub for your pork belly. Rub mixture into all sides of your pork. 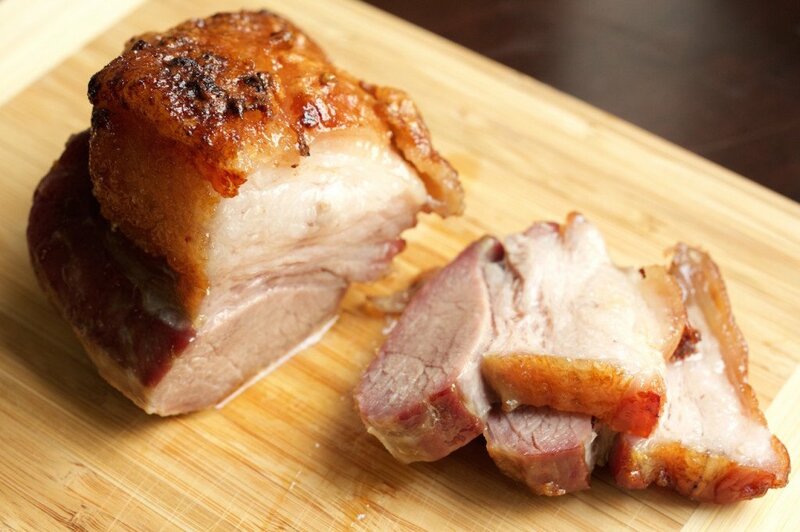 Place pork on a clean dish and refrigerate overnight. Preheat oven to 500 degrees, and lightly grease a 9-inch round baking dish. Scatter the butter pieces evenly over the dry ingredients and cut in with a pastry cutter or fork, until the mixture resembles coarse cornmeal. ** Dough will be wet, sticky and a little lumpy. ** You should get 8-9 mounds of dough. Flour your hands (and prepare to flour your hands for each biscuit! They are so sticky! ), then one at a time, pick up each piece of dough and gently shape it into a rough ball. Shake off the excess flour and place the ball of dough in the prepared cake pan. Repeat with the remaining mounds of dough, until the cake pan is filled. Gently brush the top of each biscuit with some of the melted butter (don’t press down and flatten them). Bake for 5 minutes, then reduce the oven temperature to 450 F.
Continue baking for 13-15 minutes, or until tops of biscuits are golden brown. Remove from oven and allow to cool. Reduce oven temperature to 425. Place your pork belly fat-side-up on a clean baking dish (I used a Pampered Chef casserole stone) and bake for 30 minutes. Reduce oven temperature to 250, and roast for another 30-40 minutes. Remove from heat, and tent loosely with aluminum foil. Put egg yolks in a blender and blend until fully beaten. Melt your stick of butter in the microwave until hot and bubbly. With your blender on low, slowly add the melted butter to the already blended eggs. Once the butter is fully incorporated, add a dash of salt and blend in lemon juice. Then add cayenne pepper to your liking. Taste and add more salt and/or lemon juice as desired. Time to poach those eggs. Bring a sauce pan of water (about 1-2 inch deep), white vinegar, and salt to a boil. Once the water is boiling, use a spoon to swirl the water for a few seconds. Turn of the heat and gently drop in an egg. Let it sit in the water for at least three minutes before scooping out and laying on a paper towel. Repeat for the second egg. 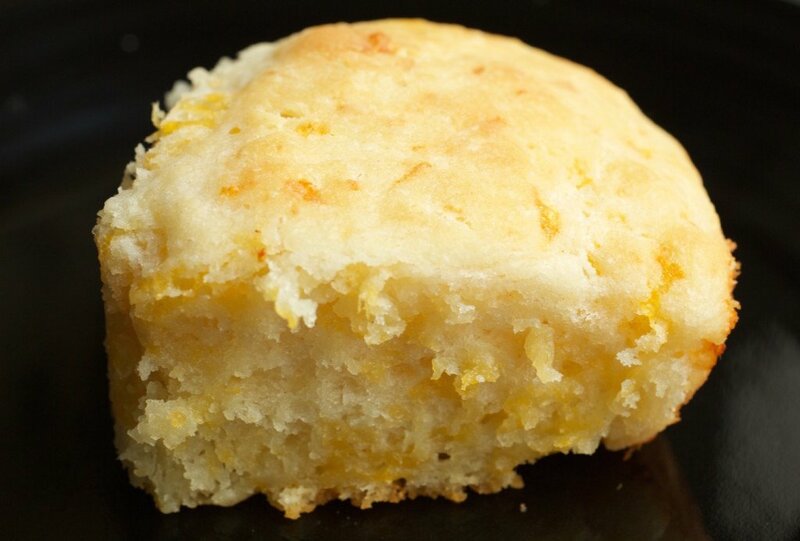 Slice a biscuit in half and lay both halves on a plate. Slice up a few pieces of your pork, and lay those on top of your biscuits. Top each biscuit/pork combo with a poached egg. Pour/spoon Hollandaise sauce on top of everything. Realize how awesome you are after biting into this amazingness!! !